The patent pending USB Flashlight-er is an in-dash, rechargeable flashlight that allows you to continue to charge any electronic application that uses a USB to mini USB adapter. 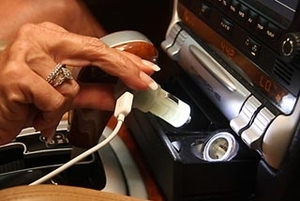 Leave it in your power port indefinitely, charging your phone, and when you need a flashlight, just remove it. The 3 LED lights automatically switch on to give you enough light, whether you are looking for change, or changing a tire. It�s smaller than any charger on the market today, and its unique design makes it attractive and more user friendly than comparable models. Is usable with all of the newest Smartphones, including the IPhone! The in-dash end of the Flashlight-er functions as a high-power flashlight fueled by three LED bulbs and a diffuser lens, which cast light over a large area, eliminating the need to focus the device for effectiveness. The flashlight functionality works hands-free; simply pull the in-dash end out of the dashboard, and the light turns on. The light�s automatic switch turns the light off when it is placed back into the dash.